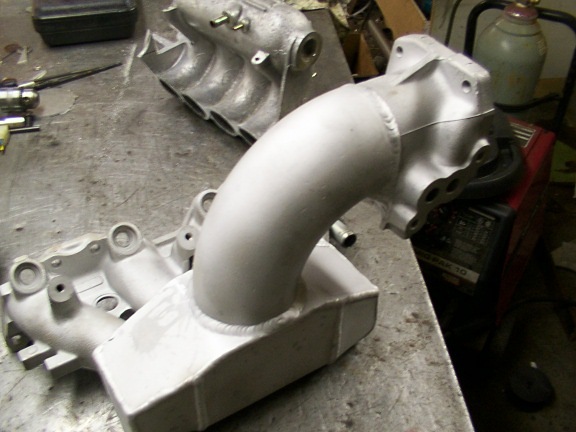 The modifications to the exhaust manifold are completed followed by the sub frame support arms for the engine..
1. The red arrows show where the heat shield mounts are located. I have already removed the top one and you can see the saw cuts as I start to remove the lower one. 2. ...and the finished manifold, now giving me the extra clearance required behind the grill. 3. 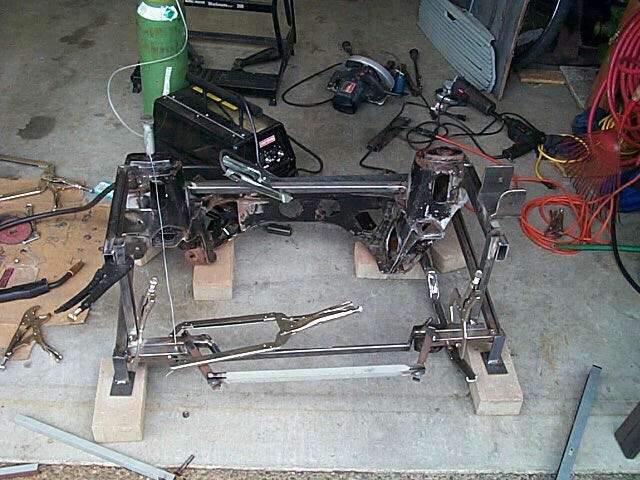 A view of the bits to be welded together for the support arms on the sub frame. Arms, and brackets. 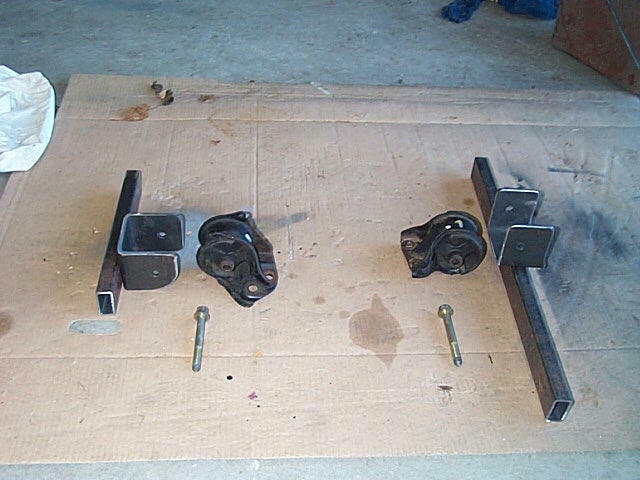 The brackets are made from some 3" square tubing with one side removed to make the U Also pictured are the engine mounts. 4. A view of the LH side support bar. 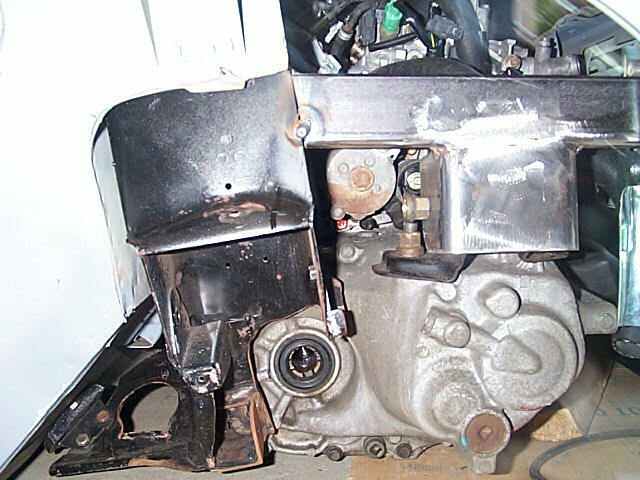 I have welded on a short piece of angle iron to help support the engine mount bracket. 5. 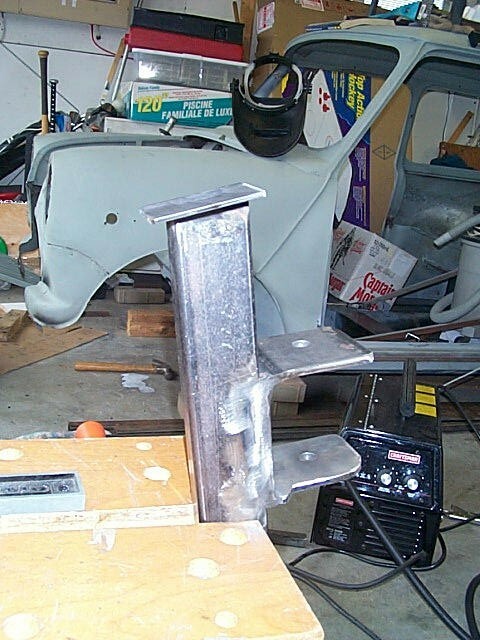 The RH side bars tacked in place on the car. 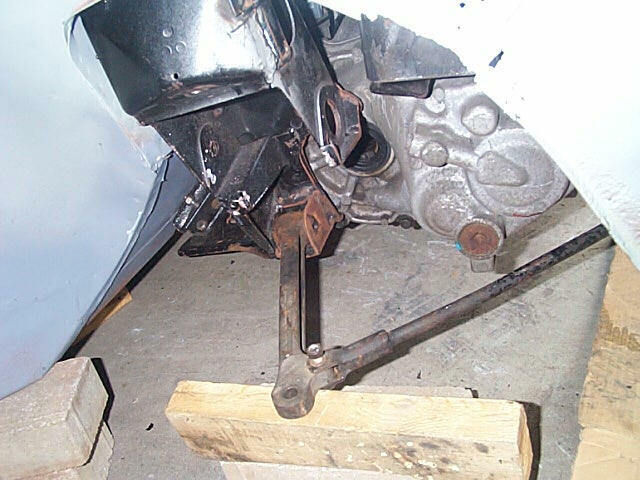 The engine mount brackets were welded to the support bars before, then the arm was held in place and tack welded. 6. 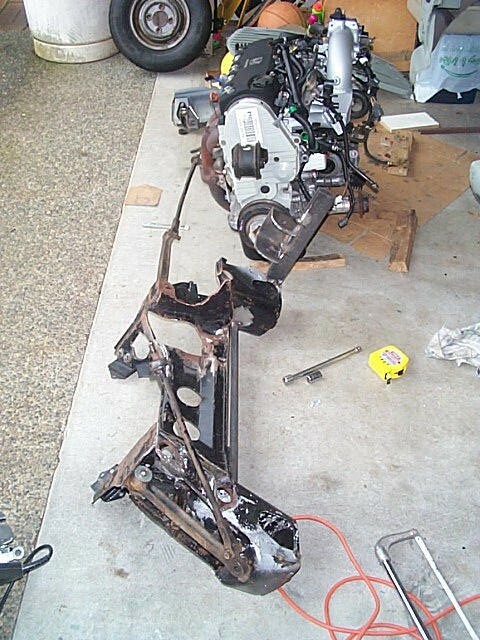 Here is a view of the LH side..again just tacked in place until I pull out the sub frame for proper welding. 7. 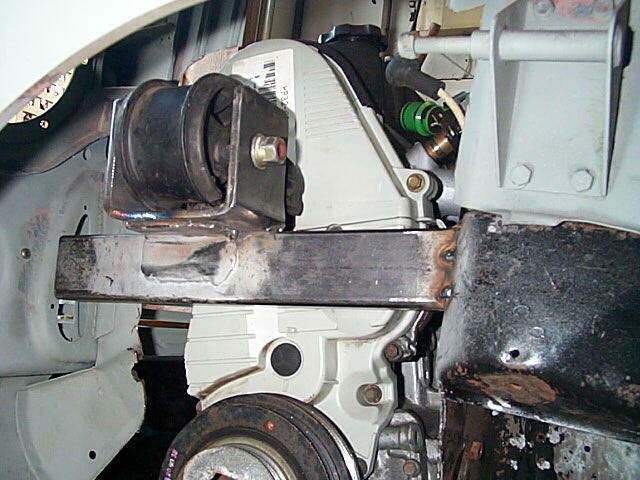 LH side viewed from the wheel well....you can see the extra angle iron supporting the bracket. 8. 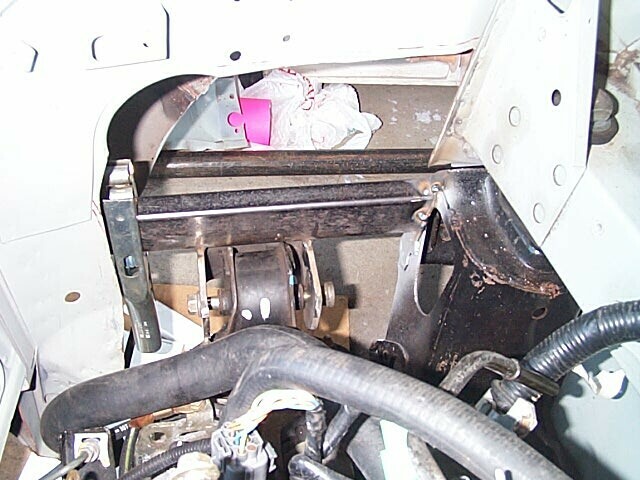 And the RH side from the wheel well...you can see the bracket welded to the support bar. 9. One last shot of the RH side... now onto the rest of the frame.... 10. Well here I have run into a problem. 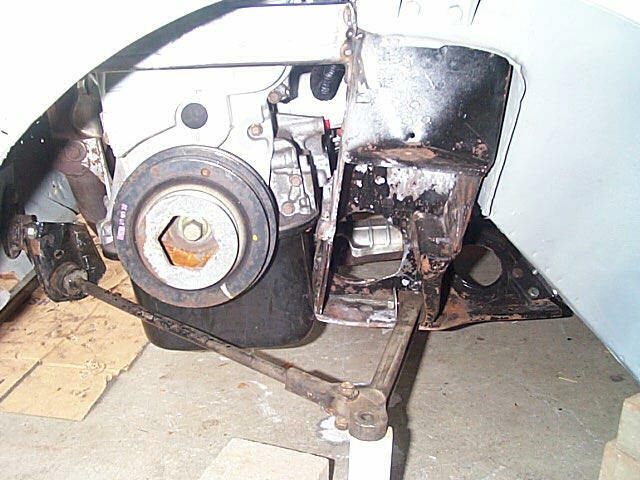 The engine is sitting too low so there is no clearance for the tie bars! 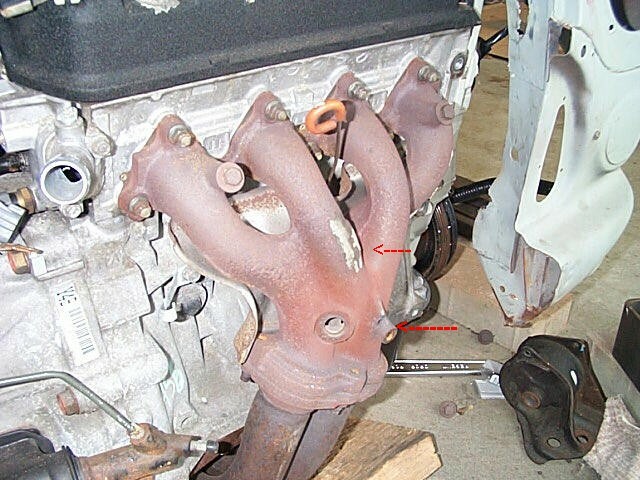 I did not take into account the sag for the engine mounts. 11. 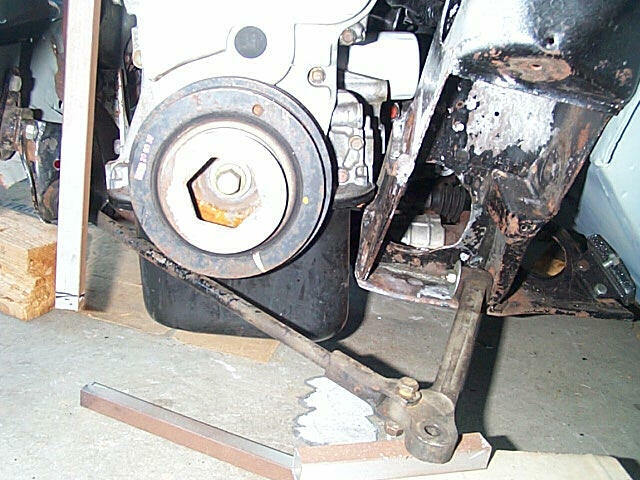 I've now pulled out the subframe and have added some 1/8 steel plate to the back of the support arms so I can lift up the arms to raise the engine higher. 12. I also added some 1/8 plate steel to the front of the tower to add more area to weld the raised arms to.Here I've just cleaned up the area to prep for welding. 13. You can see that the support arm is now higher than it used to be. 14. 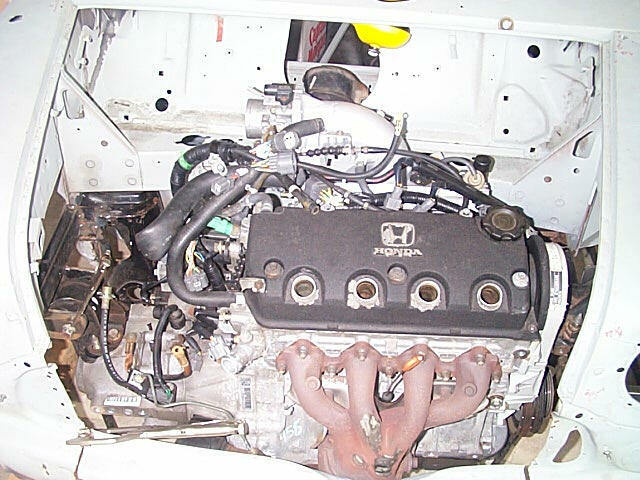 Now with the engine back in the car, I now have the clearance I need and the drivehafts are still OK for alignment. 15. Still lots of hood clearance. 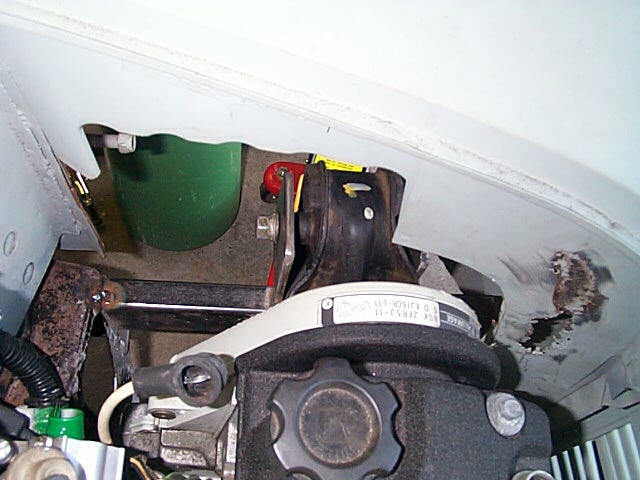 You can also see the raised LH side mount. 16. And lots of clearance on the LH side as well. 17. 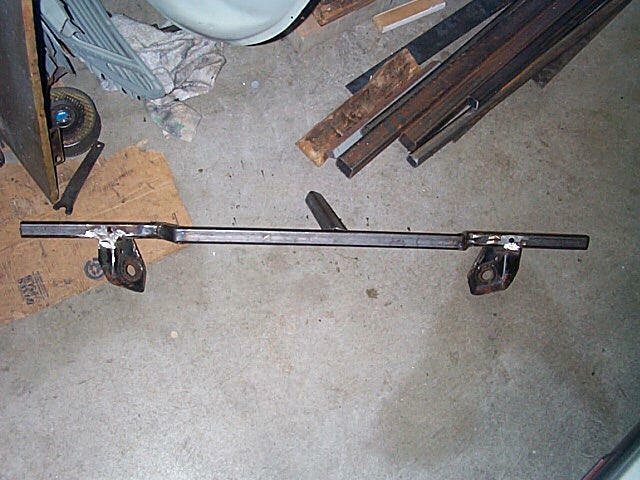 Here is the front bar where the front apron and the tie bars will mount. 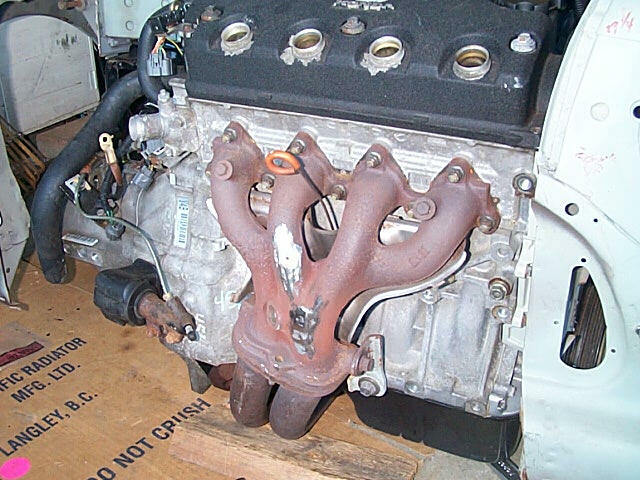 Notice it comes out to go around the exhaust manifold. 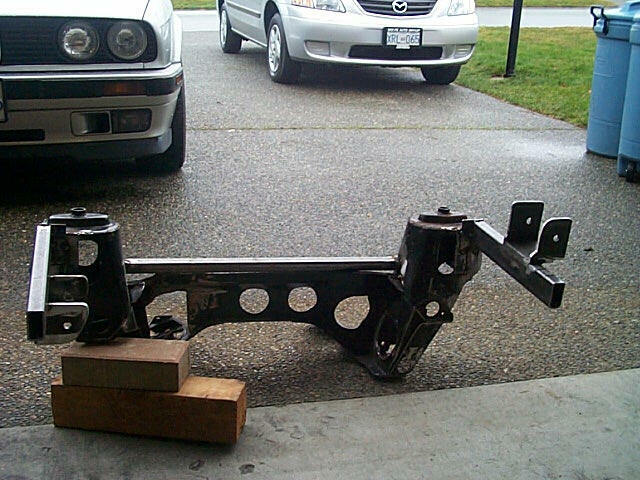 I used the jig I built earlier to ensure the alignment between the body mount holes and the tie bar brackets. The metal in the centre is just holding up the bar for the picture. 18. 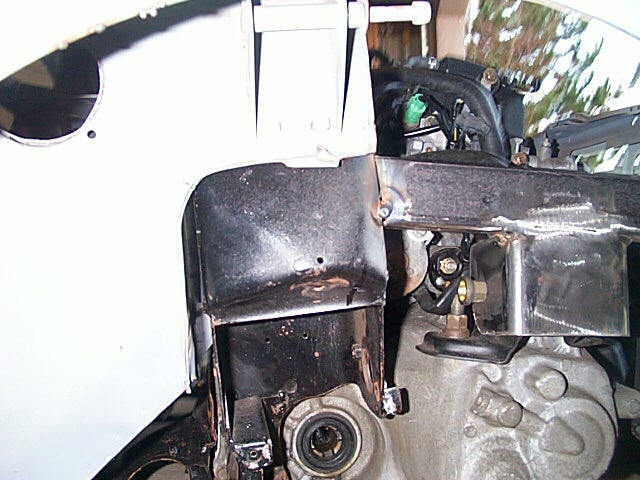 The tie bar brackets were cut off the old subframe and re-used. 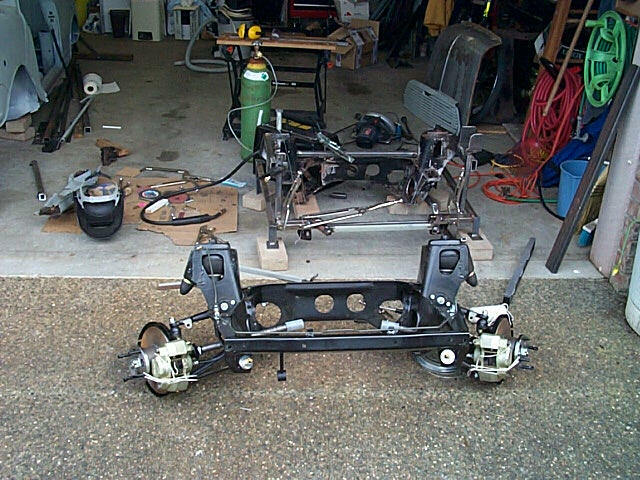 The next step is to fabricate the rest of the frame sides and tie it all together using the jig to keep the alignment correct. 19. 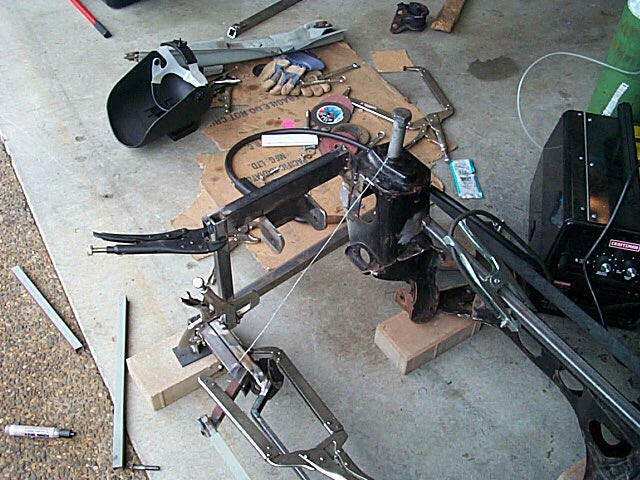 Here I have modified the jig to hold the subframe and it's getting set up to weld the side bars in place, once alignment is confirmed. 20. I am verfiying the measurements and alignment using a new subframe and taking measurements from the tower bolts direclty to the body monting bolts and diagonally as well. 21. 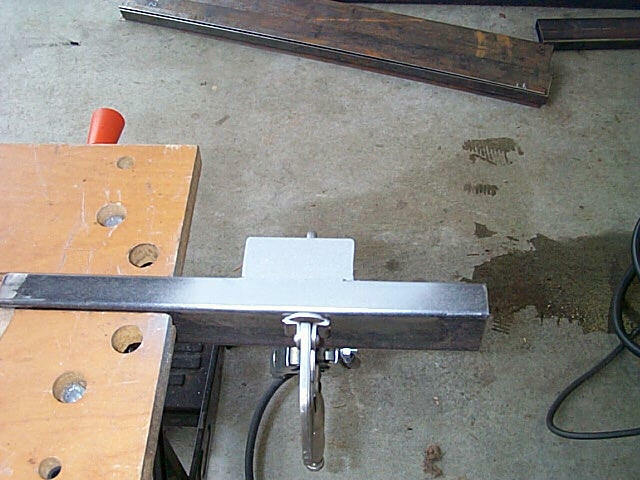 Here you can see the bar in place ready to be spot welded, and the measuring wire in place. 22. 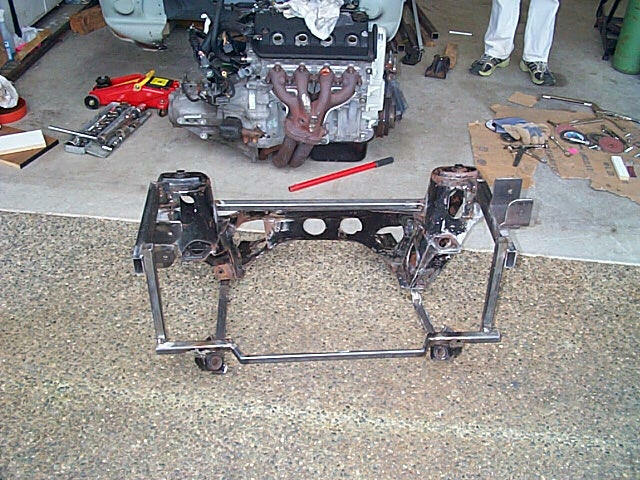 Here's the almost finished frame. Just some reinforcing bars, cleanup the extra length on the ends of the bars, add the brakeline tabs, and the final weld and painting to go. I'll post full meaurements after this is done.